To us the most disturbing aspect of the Yahoo pound-for-pound ratings which through some strange logic or is it magic saw Floyd Mayweather Jr replace “Fighter of the Decade” Manny Pacquiao as pound-for-pound king, was the claim that the results were based on a group of so-called “elite” boxing writers. Really now? The alleged “elite” list was loaded with Americans while it seems from Iole’s assessment not a single Asian boxing writer qualified for his “elite” status and therefore not polled despite the fact that Pacquiao, a Filipino and Pongsaklek Wonjongkam, a Thai also figured in the pound-for-pound voting. Not even Joe Koizumi, the Japanese boxing writer whose English may not meet the standards of Iole but who was good enough to make the Boxing “Hall of Fame,” was considered. Iole claims it was an “elite panel from around the world.” Take a look at his list. Voting panel: Raul Alzaga, Primera Hora; Ron Borges, Boston Herald; Steve Cofield, Yahoo! Sports; Dave Cokin, ESPN Radio 1100, Las Vegas; Andrew Eisele, About.com; Doug Fischer, Ring; Scott Fyfe, Sunday Post, Scotland; Thomas Gerbasi, Boxingscene.com; Carlos Gonzalez, Primera Hora; Lee Groves, BoxingScene.com; Thomas Hauser, Seconds Out.com; Keith Idec, Herald News, New Jersey; Kevin Iole, Yahoo! Sports; Max Kellerman, HBO; Scott Mallon, Boxing Digest; Rich Marotta, Fox Sports; David Mayo, Grand Rapids Press; Franklin McNeil, ESPN; Gunnar Meinhardt, Die Welt; Robert Morales, Los Angeles Daily News; Marty Mulcahey, MaxBoxing.com; Kieran Mulvaney, Reuters; Peter Owen Nelson, freelance; Brett Okamoto, Las Vegas Sun; Santos Perez, Miami Herald; Martin Rogers, Yahoo! Sports; Michael Rosenthal, Ring; Lem Satterfield, Fanhouse.com; Tim Smith, New York Daily News; T.K. Stewart, Boxingscene.com; Dave Weinberg, Press of Atlantic City; John Whisler, San Antonio Express-News; George Willis, New York Post. If this is Iole’s world then it’s a small world, isn’t it ? Give us a break. Iole includes writers from Ring Magazine which is owned by Oscar De La Hoya whose Golden Boy Promotions handles Mayweather and thinks, for selfish reasons, that Mayweather is the greatest when Oscar himself thought he beat Mayweather in their fight. 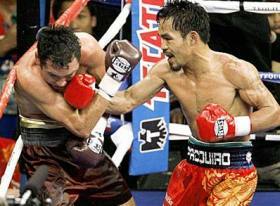 But there were no no doubts at all that he was pulverized by Pacquiao and quit on his stool, a forlorn and battered figure. The same figure that people like Iole predicted was too big, too strong and too good for Pacquiao and whom De La Hoya promised to knock out only to get his pretty face smashed. He had two journalists from Puerto Rico’s Primera Hora but none from Mexico which is a hotbed of boxing. Interesting indeed. Certified friend of Mayweather and his handler Leonard Ellerbe, David Mayo from Grand Rapids Michigan where Floyd comes from was also on the list. Nothing personal against David who seems to be a nice person but its obvious whose side he is on. He even has a freelance writer listed as “elite!” Nothing against Peter Nelson personally but it does seem odd that a freelance writer is included while such distinguished writers as Bill Dwyre of the Los Angeles Times, Nancy Gay of AOL.Fanhouse, the many excellent British boxing writers who fell in love with Pacquiao when he toured Britain prior to the Ricky Hatton fight. For the record, that was the fight where Manny separated Hatton who was trained by Floyd Mayweather Sr from his senses in two rounds while Mayweather took ten hard rounds before he disposed of the British “Hitman.” Also left out were respected publications such as USA Today and many others that apparently failed to make Iole’s “elite” list. How in heaven’s name can the prestigious Boxing Writers Association of America vote Pacquiao as “The Fighter of the Decade” beating Mayweather by bigger than a 2-to-1 margin only for Iole and his “elite” handpicked group to, in a sense, try to undermine that decision by their own biased poll? If this is not a pre-ordained survey we don’t know what is. Beyond all this is the startling contrast between the humility and decency of Manny Pacquiao and the foul-mouthed Mayweather whose HBO Sports 24/7 series was laced with the F word giving us some idea of the difference in breeding between the “elite” clearly represented by Pacquiao no matter his childhood poverty and the obnoxious Mayweather. Iole’s reference to the writers as “elite” is fundamentally the kind of classification that irritates most of the rest of the world and regrettably reflects the tendency of some condescending Americans to believe that they are the greatest in every aspect of international life and that they have an inherent right to decide.